F&B and I are really excited to check out House of Bounce in Colorado Springs this weekend. Colorado Springs House of Bounce offers over 9,000 sq. 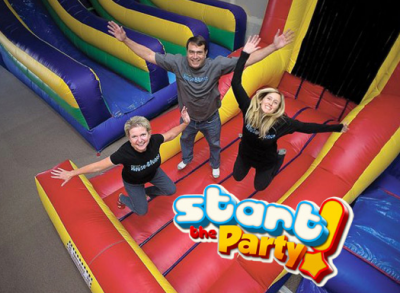 ft. of inflatable fun, including slides, obstacle courses, magic castle bouncers and jumpers. It was design to provide a fun safe environment for kids to play, and as a transplanted Texan, we *LOVE* indoor play areas in the Colorado winters! Besides free play, House of bounce offers three private party rooms for birthdays or other special occasions. There is also a designated toddlers’ area downstairs with an interactive bounce house, rollercoaster, playscape and rocking horses, perfect for little ones to play safely. The concession stand area is located upstairs with tables and chairs overlooking the play area so parents can relax while watching their children play. Right now, House of Bounce is offering a coupon for $1 any admission. As well, just show your Military ID for an additional $1 off.